Representative Honours: Northern Ireland: 1 Full Cap (1967), 3 Under-23 Caps (1967-1969). Club Honours: (with Airdrie) Scottish League Division Two Runner-Up 1965/66; Texaco Cup Runner-Up 1971/72; (with Clydebank) Scottish League Division Two Champion 1975/76; Scottish Spring Cup Runner-Up 1975/76. Awards: Airdrieonians Hall of Fame. 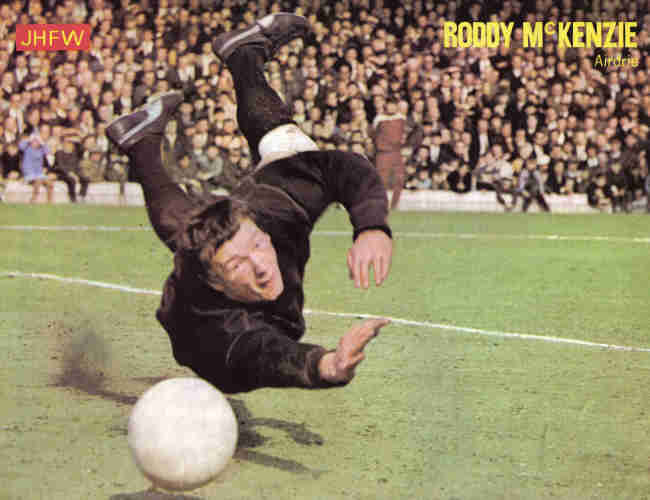 Regular back-up to Pat Jennings for a few seasons in the late-sixties, Roddy McKenzie suffered the same fate as many other Northern Ireland goalkeepers over a twenty-two year period – extremely limited chances. 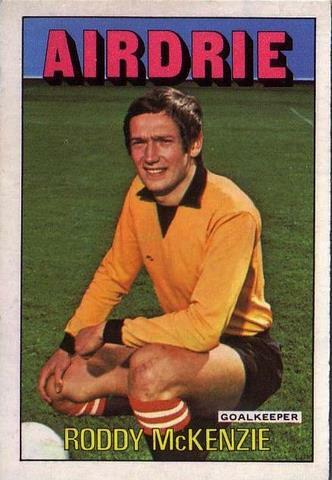 McKenzie spent almost his entire career in Scottish Football, starting out with Drumchapel Amateurs. With Airdrie he was the regular number one for close to a decade, helping them to promotion to the First Division (then the Scottish game’s top-flight) in 1966. In 1972 he was part of the Diamonds side that lost narrowly to Derby County, who that season were English champions, over two legs in the Texaco Cup. Following Airdrie’s relegation in 1973 McKenzie failed to agree a new contract with the Diamonds and instead stayed in the First Division with Hibernian. Signed as emergency cover for Hibs' regular 'keeper Jim McArthur who had suffered a broken foot. McKenzie next appeared in the Scottish League for Clydebank as they claimed the Division Two (by then the third tier) title in 1976 with a line-up that featured an exciting young winger by the name of Davie Cooper. That same season he appeared in the once-played Spring Cup Final, losing out after extra-time to ex-club, Airdrie. In the veteran stage of his career McKenzie moved to Australia, where he played for Brisbane Lions. Summary: 3/0. Won 2, Drew 0, Lost 1. Pictures from Jimmy Hill's Football Weekly. If anyone can help Jim, please get in touch and we’ll pass the message on.